Memorial projects seem to be coming online at a faster pace than ever before due to the fatal events our country has experienced in the last three years. Such rapid production of commemorative architectural spaces appears to immediately bring healing and hope back to the communities and victims where these tragedies have occurred. While it’s more important than ever to honor the countless lives lost from social violence, terrorism, and natural disasters, to Svigals+Partners, the process of memorial creation, sometimes slow and complicated, exposes the heart of the design. 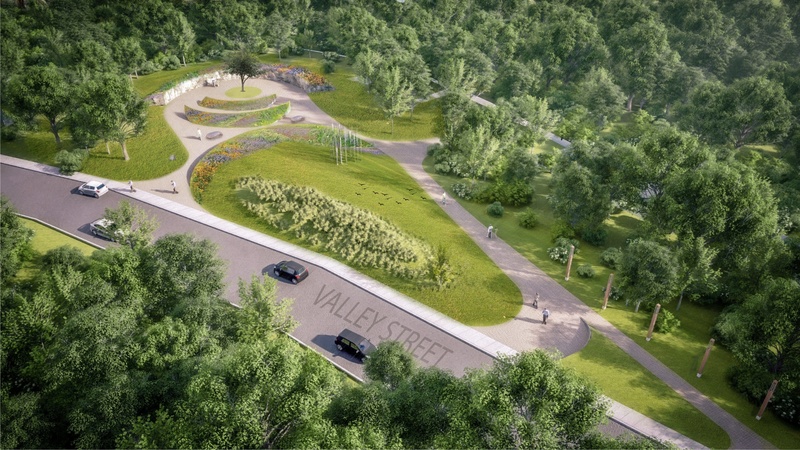 The firm recently released renderings of a new memorial garden dedicated to victims of gun violence in New Haven, Connecticut. 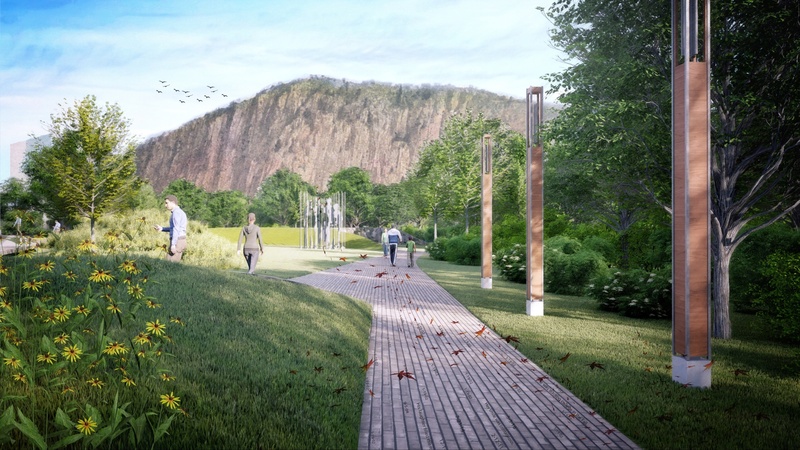 Led by the company’s Director of Art Integration Marissa Mead and Associate Principal Julia McFadden, the (tentatively-named) Healing Memorial Garden will soon be built at the base of West Rock, a monumental boulder that bounds New Haven. Born from the vision of Marlene Miller Pratt, a school teacher whose son was shot and killed over 20 years ago, the landscape is the result of her many years spent advocating for a communal place to remember her child’s life. She connected Yale University’s Urban Resources Initiative and other mothers who’ve suffered similar losses to jumpstart her long-awaited vision. After countless hours of community engagement, Mead and McFadden, the latter of whom was responsible for the redesign of Sandy Hook Elementary School in Newtown, Connecticut, discovered that this particular memorial effort has further embedded into them the value of listening. AN spoke with the architects about modern monument design and why they herald conversation and collaboration as the foundation of memorial creation. AN: What drew you both to get involved in this project? 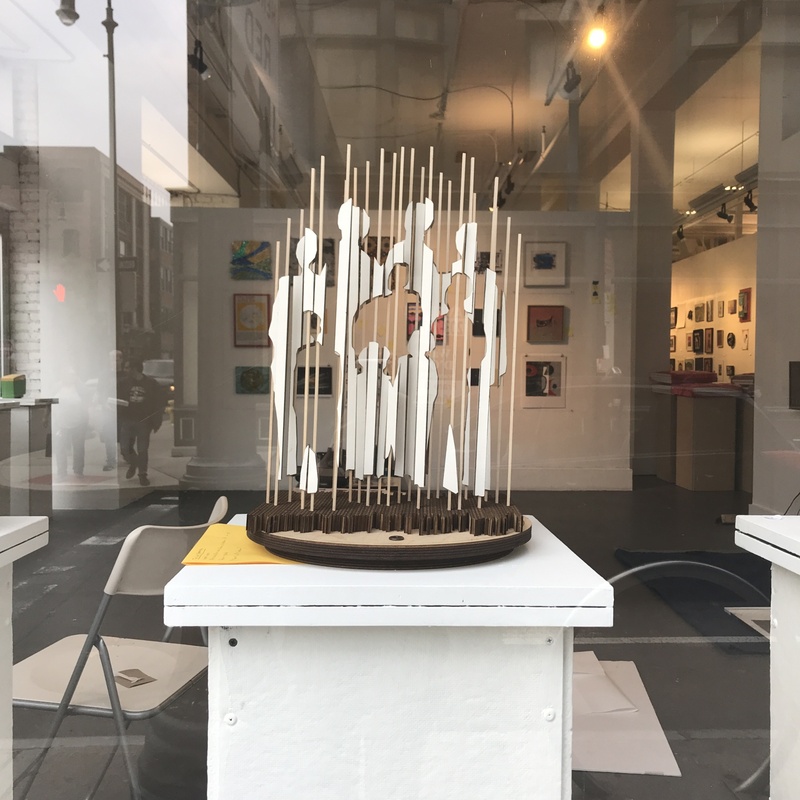 Julia McFadden: When this came our way, I was working on a side project—a competition entry for the Sandy Hook Memorial, a tragedy that also resulted from an act of gun violence. I believe experiential design and public art define what a memorial is today, two things Marissa and I specialize in, so this, along with our personal interests, was important to us. I’m also particularly attracted to social justice issues and concerned about the allocation of resources that create economic segregation in neighborhoods, such as unequal community policing. That method was actually born in New Haven and then dropped nationwide, which led to more disproportionate levels of communities of color being sent to jail. Marissa Mead: I’m also interested in creating meaningful environments for people by engaging them in the process and helping to tell stories. As director of art here at Svigals, I aim to create places where we want to be and places where we’re inspired. This has been an ongoing process of raising awareness in the area both about the memorial and education on gun violence. AN: Prior to rethinking designing for school safety at Sandy Hook, had either of you been involved in projects that were birthed out of community tragedy? MM: No, but at our firm, we’ve developed over time a very inclusive and collaborative process for the early stages of our building projects. That’s been hugely successful in school projects. We learned we have to get people together to listen to each other from the start. They need to feel heard and comfortable to share opinions. That’s how we get them to hone in on most important aspirations for the school. AN: What do you both think are the challenges of designing memorials for 21st-century loss? JM: Our impulse to memorialize is a very human kind of thing we’ve seen throughout history. We want to recognize and pay our respects to losses that have occurred by leaving teddy bears and heart balloons at the site of car accidents and house fires. I’m not sure we as a society fully understand what that impulse is all about, but the history of commemorating death is obviously evident with cemeteries and grave sites, which are static tributes. Nowadays, we see through working with people like Marlene that people want these memorials to be interactive. Today’s memorials dedicated to these types of loss are different than say, memorials around war. Those are typically planned as we expect death from war. I think historically Maya Lin’s Vietnam War Memorial shifted the purpose of what a memorial could serve since the deaths exceeded what was initially projected. The challenges of designing around tragic events today are that we’re constantly trying to balance transitory commemoration versus more permanent sculptures set in place. To me, what leads us to build a permanent memorial is the communal need to remember something for a longer period of time. There must be a recognition that there’s a lesson to be had for current and future generation in memorializing this subject. It must find greater purpose and promote a larger message that has meaning for a broad range of people to tap into some larger universal themes. AN: What about designing memorials that honor America’s harsh past years after the fact? MM: A hurdle in highlighting more historic issues is that perceptions may be challenged. People should be encouraged to recognize that the history they’ve learned may be incomplete. It takes some time to get past the layers of defensiveness and/or shame and arrive at acknowledgment. Acknowledging the past is a mechanism that helps us more fully understand the present, so we can begin collectively to heal from painful, even catastrophic, events. In the case of the Newport Middle Passage Port Marker Project, which I’m helping with, a driving reason to create a memorial is to bring stories to light which have been previously hidden. Newport, along with nearly all other major ports in the eastern U.S., has not publicly acknowledged how the city built its staggering wealth. Rhode Island alone participated in the trafficking of over 100,000 enslaved individuals, and the proud historic buildings of Newport were made possible by the trade of human beings. But these truths are not at all evident in the city. It’s an incomplete history, which leads to an incomplete understanding of the continuing impact that slavery has on our communities. A theme repeated in the visioning workshop I helped lead for the Middle Passage committee is that injustice is not was. There is work to be done. AN: We’ve noticed many memorial projects announced in the last year, some of which have fast-paced construction goals. What do you think about this newfound attention to both memorial commissions and competitions? JM: To me, the process is and can often be the point of memorial making. If a project moves too fast or doesn’t get the right input, you’re going to miss some major opportunities and the memorial will have a stifled response that isn’t fully formed. The best memorials create a visceral bodily experience that doesn’t depend on reading a plaque. You feel something because your senses are engaged, and I think it takes a long-term input process to solicit the needs of the community you’re designing for. With the Healing Memorial Garden, we’ve been really conscious about what you’d see, hear, feel, and smell on the site. Through a variety of design components, we want people to connect to the memorial through both their head and their heart. MM: That’s not easily achieved if we don’t know the emotions people want to be expressed through the design. If the design happens in a vacuum, it’s the wrong design. It’s short-changing that front end of memorial making which really is so critical. I truly believe grief compels people into action—they want to be involved. While the final, completed memorial might be the ultimate goal, the journey to get there is healing in its own way. That’s why I think when a memorial project comes online, the commissioning team would start a qualifications-based solicitation process of designers, instead of a full-fledged competition. That way designers are chosen based on their merits and experience, as well as their knowledge of a community, and willingness to truly understand what those people are going through.